ATLANTA --Falcons running back Devonta Freeman left Sunday's 24-21 loss to the Indianapolis Colts with a concussion suffered in the first quarter and was ruled out for the game. Freeman walked to the locker room with 9:20 remaining in the quarter, shortly after he broke loose for a 39-yard run. It's unclear exactly how he suffered the injury. He was replaced by rookie Tevin Coleman, who began the season as the starting running back. Coleman finished with 48 yards on 17 carries. The injury means the Falcons are without one of the league's top running backs and a player who has scored 11 touchdowns this season. 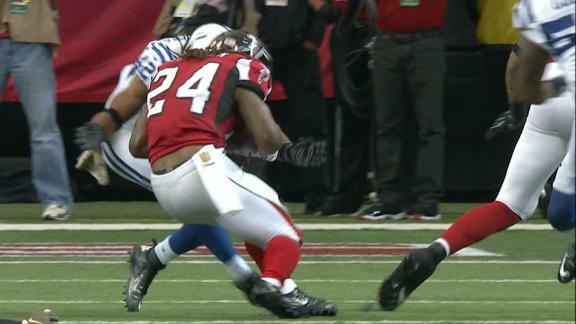 Falcons RB Devonta Freeman gets hit in the head by Colts S Clayton Geathers and is forced to leave the game with a concussion.